There’s more than dinosaur fossils in ‘em hills. 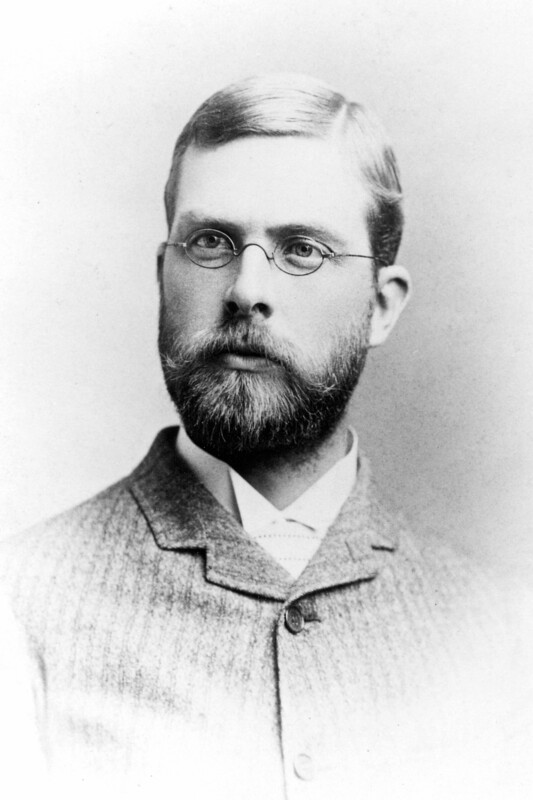 In 1884, geologist Joseph Burr Tyrrell discovered huge coal outcrops and a 70-million-year-old dinosaur skull in the Red Deer River Valley. Drumheller’s history is strongly linked to its wealth of natural resources. More than 130 coalmines operated in the valley between 1911 and 1979. Though Drumheller has since become world-renowned for dinosaur fossils, it was the abundant coal deposits within the surrounding badlands that gave life to the community. Samuel Drumheller (behind the wheel circa 1913-15) won a coin toss in 1910 against homesteader Tom Greentree over whose name the site would bear. (Glenbow Archives NA-2389-20). Peter Fidler encountered pronounced coal seams by the Red Deer River at Kneehills Creek while surveying the area for the Hudson’s Bay Company in 1793. After Samuel Drumheller bought local land in 1910 and sold it to Canadian National Railway for further development as a townsite, Drumheller’s coal rush began. The community’s first mine, Newcastle, opened in 1911. 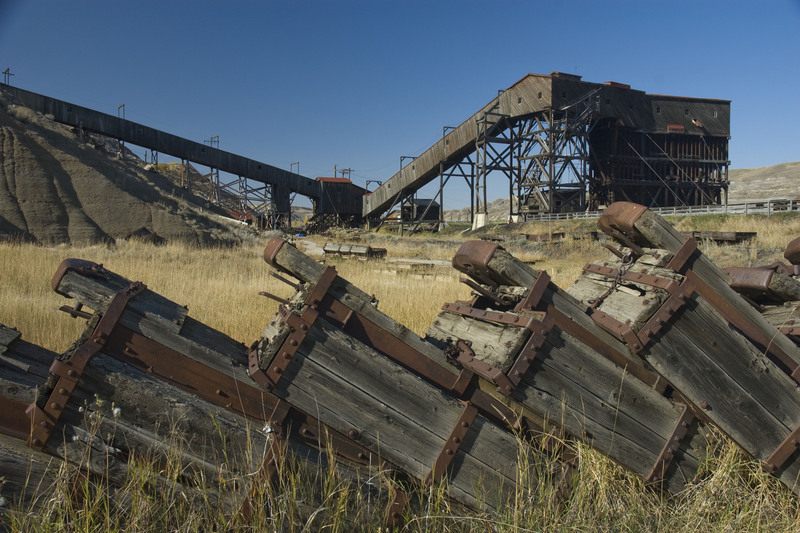 Several mines were subsequently founded before Drumheller’s incorporation as a village in 1913, as a town in 1916 and as a city in 1930. 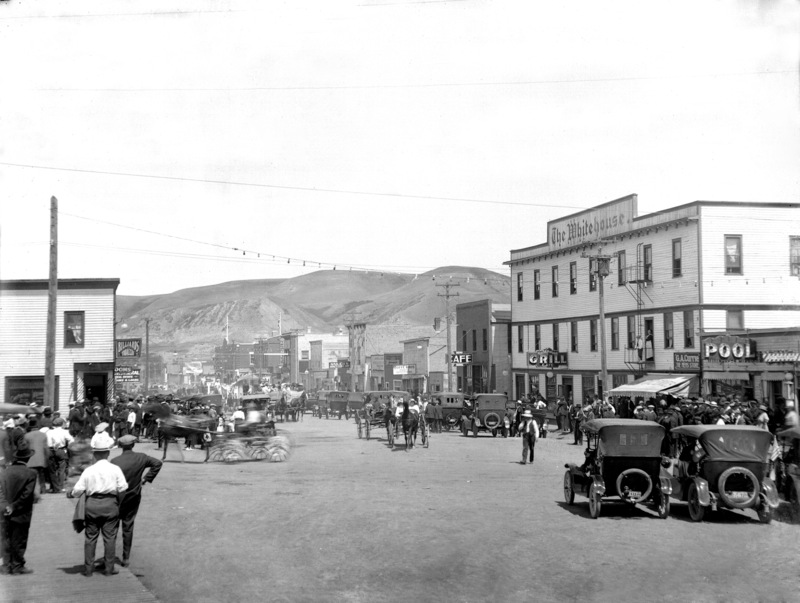 By 1920, Drumheller’s main street was a bustling centre of a growing community. (Provincial Archives of Alberta A15275). At its peak, this “Wonder Town of the West” was a booming coalmining mecca with over 30,000 residents and once among the fastest growing municipalities in Canada. Some of the valley’s mines lasted for decades. When the region’s last closed in 1979 amid oil and natural gas expansion, it marked the end of the valley’s coalmining era. In the vacuum created by a fallen coal industry, plans to construct a world class museum were put into motion. The Tyrrell Museum of Palaeontology opened in 1985. Atlas Coal Mine National Historic Site: the last wooden tipple standing in Canada. Today, Drumheller celebrates its unique heritage as a modern hub of the Red Deer River badlands. This is the place where many of the world’s most extraordinary dinosaur specimens are excavated and showcased, and where some of Western Canada’s greatest coal production occurred. Drumheller Valley is one of Alberta’s best known tourism destinations. Here, you can explore both ancient and modern landscapes. Written by: Jeff Sterr, Historical Places Research Assistant. 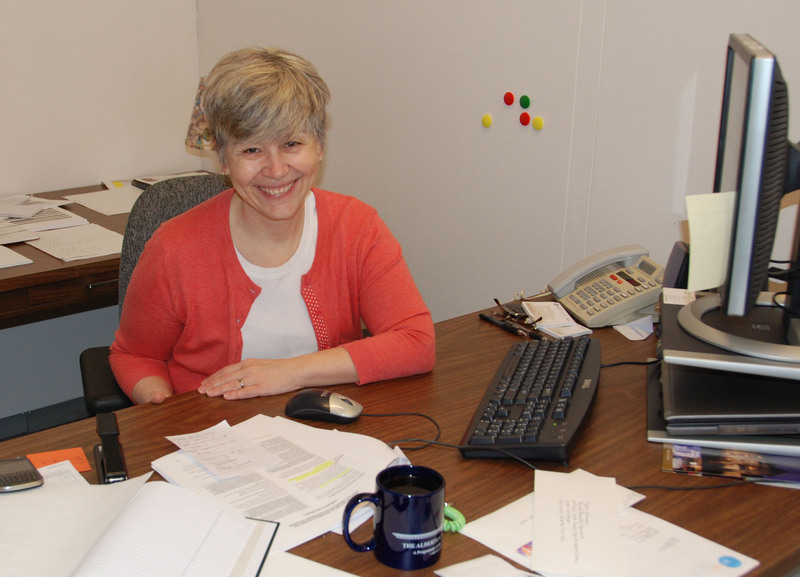 Hi, I’m Sandy I am the new Heritage Conservation Adviser in the Historic Places Stewardship Section. While new to Alberta’s Ministry of Culture, the field of Cultural Resource Management is not new to me. I have worked for the City of Ottawa as a heritage planner; for the Heritage Canada Foundation as Medicine Hat’s Main Street Coordinator; was the Built Heritage Project Officer for Jasper National Park; and; the Parks Canada National Historic Sites Cost-Sharing Coordinator for Alberta and British Columbia. I was most recently a heritage resources and community planner with the Parks Canada Agency. Amongst my duties in that position I was the Federal Heritage Building Review Office Coordinator all of Western and Northern Canada. My work with Parks Canada saw me working in massively diverse geographical areas from Waterton Lakes National Park in the far south west corner of the province to Sheep Creek Warden’s Station located in the middle of Ivvavik National Park in the far north and, from Riding Mountain National Park in Manitoba right across the prairies through the Rocky Mountain National Parks to Vancouver Island. The heritage buildings and properties that I was dealing with included everything from small wardens’ cabins in the remote back country of the Rocky Mountains National Parks; privately and publicly owned residential, commercial and institutional heritage buildings in national parks and national park communities, and; buildings and structures located at national historic sites. The variety and types of heritage buildings was endless and, when combined with their specific geographic locations, the experiences were all highly memorable. My education has provided me with an understanding of historic place conservation and management. I hold a Bachelor of Arts Degree, in Canadian History and Urban and Regional Geography, from the University of Victoria; a Masters of Environmental Design in Urban and Regional Planning from the University of Calgary where I specialized in heritage planning, and; a Masters of Arts in Conservation Studies (Historic Buildings) from the Institute of Advanced Architectural Studies, the University of York, England. You will find me to be a very personable person who is highly supportive of colleagues and who enjoys a team-based collaborative work environment. I am truly excited and absolutely thrilled about working as a Heritage Conservation Adviser and look forward to meeting new colleagues, and getting “out in the field” with the owners of designated properties. Written by: Sandy Aumonier, Heritage Conservation Adviser. 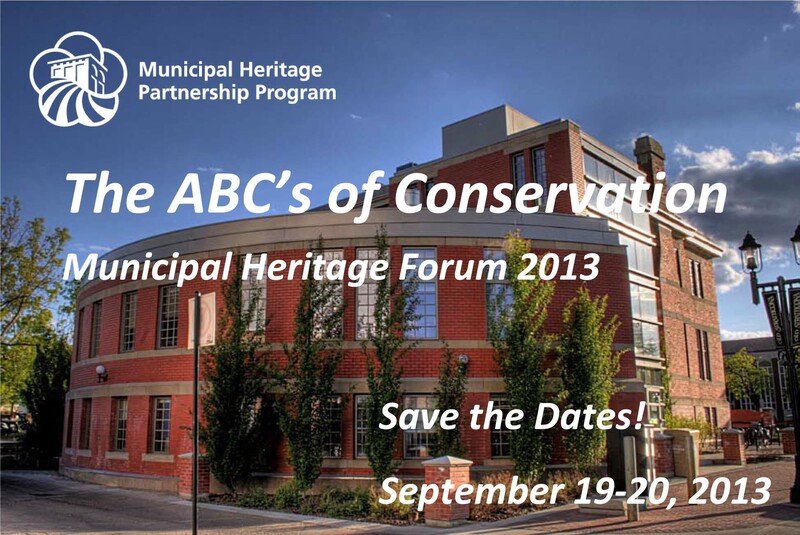 Heritage Forum 2013 – Save the Dates! WHAT: Our 7th annual Municipal Heritage Forum! WHY: To help create a future for Alberta’s historic places. While each year we try to carefully minimize scheduling conflicts with other important happenings on the heritage scene, sometimes overlaps occur. Some RETROactive readers will want to know that this year’s Forum is taking place at the same time and in the same fair city (Edmonton) as our friends from the Alberta Museums Association are hosting their Annual Conference. Please keep in mind that both the AMA Conference and our Municipal Heritage Forum allow for single-day registrations. This may allow some attendees to maximize their trip to Edmonton to take in the best of both great events. We will also be co-hosting a reception with the AMA on Thursday evening, Friday 19th. 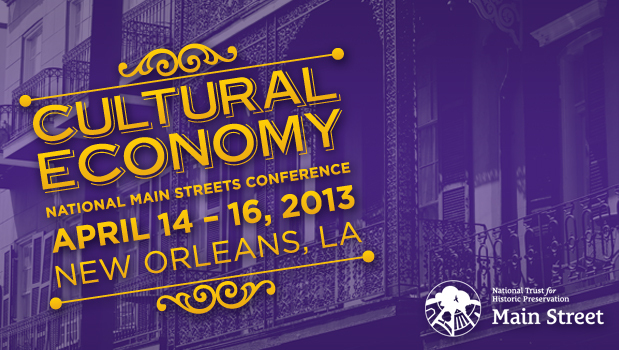 Full information on Forum 2013, schedules, and registration materials will be available soon! Stay tuned to RETROactive for details. The Society for the Study of Architecture in Canada is holding its annual conference in Edmonton from May 29 to June 1. This year’s event, Infrastructures and Institutions: Settings for Life, will bring people from across Canada together to share information and ideas about architectural history, heritage resource management and other related topics. Over 40 speakers will participate 10 sessions on the University of Alberta campus. Ministry of Culture staff will make presentations in Session 5: The Role of Government Programs in the Conservation and Commemoration of the Built Environment. This will be a lively, Pecha Kucha format session that promises to be very interesting and engaging. Other sessions will address Aboriginal themes in contemporary architecture, teaching architectural or design history in Canada, the role of churches in our communities, and the place of Arthur Erickson in the history of Canadian public architecture, among other topics. The third day of the conference is given over to an all-day bus tour that includes a train ride and banquet. You’re welcome to attend! To register, visit the conference page of the society’s website. A few weeks ago, I was live-blogging from the the U.S. National Trust for Historic Preservation’s Annual Main Street Conference. The conference is attended by leaders from hundreds of historic main street communities across North America. Here are some final thoughts, after returning home to Alberta. Robert’s presentation reminded me how a number of our historic Alberta Main Street communities are great places to enjoy good food in authentic, fun environments. In particular, his presentation reminded me of Downtown Lethbridge, where an exciting food and coffee culture has emerged over the past several years. Other places in Alberta are seeing great new restaurants, coffee-houses, artisan bakeries, micro-breweries, and fantastic food trucks enrich and enliven neighbourhoods, and jump-start uses for historic buildings. There are some tremendous entrepreneurial opportunities out there. The historic vibe, feel, and values in our traditional commercial districts only adds to the appeal. Next Year in Detroit – Works in Progress! 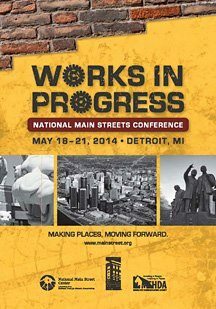 Detroit will host the 2013 Main Street Conference. The wrap-up session concluded with a presentation by next-year’s host city: Detroit, Michigan. Now, much ink has been spilt describing Detroit’s catastrophic urban decline over the past few decades. Hundreds of blocks of blighted houses and commercial buildings have been bulldozed due to the severity of the situation. But that is all changing. Detroit is using Main Street’s Four-Point Approach® to bring its downtown back from the ashes. Jane Jacobs said that “new ideas need old buildings,” and that is definitely part of what is happening in Detroit. It’s inspiring to see what is happening around the world, but it’s even more exciting to see what’s happening across Alberta, in our own backyard. Stay tuned to RETROactive for updates on historic main street news from across the province.